The ART- a luxury boutique hotel that blends modern design; technology; stylish spaces and custom amenities to meet the needs of the elite traveler. The ART features museum quality art; innovative design and high touch service. The ART offers 165 rooms/ 4100 square feet of meeting space/ fitness center/ one of a kind dining experience and outdoor terrace with city views. Our location is steps away from the Denver Art Museum and the History Colorado Museum. 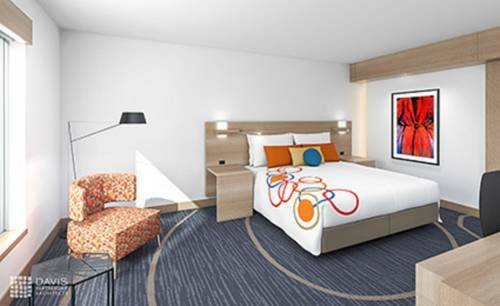 The ART is convenient for the business traveler being located nearby to the Financial District/ Civic Center/ Judicial Center/ Colorado State Capitol and the Colorado Convention Center. The ART- an urban oasis located in the heart of downtown Denver. Fire: Serving breakfast lunch and dinner daily as well as weekend brunch and signature craft cocktails. The restaurant offers expansive windows overlooking Broadway and the Rocky Mountains. Enjoy small plates with a craft cocktail on the outdoor terrace. FIRE Terrace: Guests at the ART can experience all of Denvers 300 days of sunshine and twinkling nights from FIRE Terrace - a unique Denver bar and dining experience with a fourth floor patio that overlooks the bustling life of the Broadway Street below. Located within Denver*s Golden Triangle and Cultural Center- the Art Hotel is a beautiful and artistic addition to the expanding cityscape of downtown Denver. The Art Hotel sits at the intersection of 12th and Broadway-adjacent to the Denver Art Museum and History Colorado.